Nowadays everyone’s busy. It has become a buzzword that borders on a cliché and a lame excuse all in one. The demands of modern-day lifestyle are pressing us and the stakes are very high. It’s our health that is at stake – mental and physical. The scenario is more than familiar to many of us. It seems as if we’re getting hustled out of our days by life’s growing demands. Stress is simply omnipresent and most of us don’t know how to cope or have the right tools for it. There are so many stress-triggering factors we’re facing on a daily basis while trying to juggle all of our responsibilities. Choose any random profession and you’ll find a survey or study showing that stress and burnout have never been more prominent. It’s the currency of time that is much more valuable than money when we look at things more honestly. Especially today. And the major currency is health. So, how to squeeze some wellness strategies into our ambitious daily schedules? We’ve asked the wellness experts to help out. Read on and learn from people who are tuned in to the subject. You might get a tip or two to help you protect your health from the ever-increasing pace of modern life. Sleep Health Foundation Australia has a few sleeping tips for those having trouble sleeping. Handling the killer pace on a day to day basis makes a good night sleep an absolute must. Or else you run the risk of letting it all wear you down. Tight deadlines and heaps of work can often lead to insufficient sleep, or no sleep at all, for that matter. If this loop continues for longer periods, your mental and physical health can deteriorate. Sometimes it’s that we merely have lots of things on our mind, so it can get hard to shut down at the end of the day. So, here’s a list of sleeping tips for you to incorporate into your daily routine for more energised and enjoyable days. Alsco, a 50-year provider of first aid kits and washroom services advises us to watch for our spine. The majority of modern jobs are linked to sitting long hours. So do yourself a favour by being mindful of your posture. Here you can’t make an excuse for being too busy. It’s just learning a few tricks and correcting yourself from time to time and – voilà, you’ve got a habit! 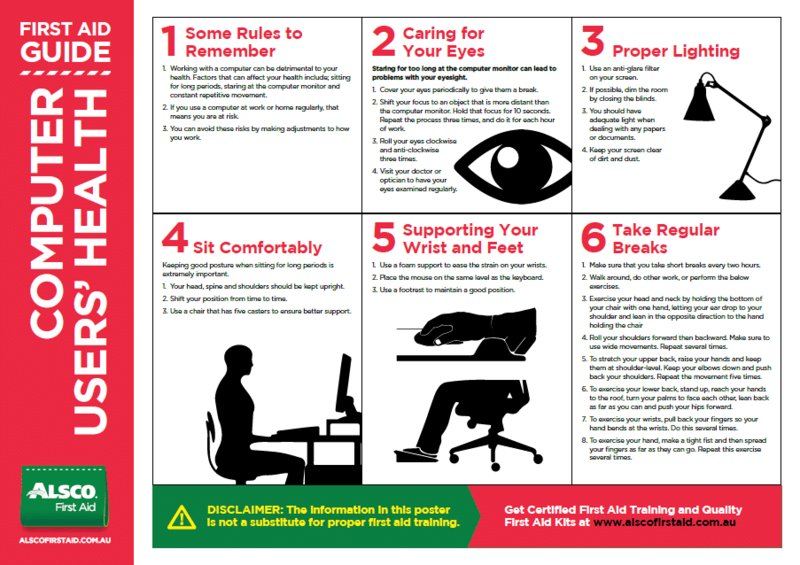 Print this Alsco’s good posture poster out and pin it up on the office wall beside your desk as a regular reminder. More or less we all realise the terrible consequences of prolonged sitting. But we rarely do something about it. Time and again our minor day to day problems seem to be more important to us than our health and well being. Staggering, but true! Yet, getting yourself a standing workplace station isn’t actually much of a hassle. And getting your boss to get you one is even smoother. Not to mention it’s cannier. All you need to do is replace your desk and enjoy the benefits. 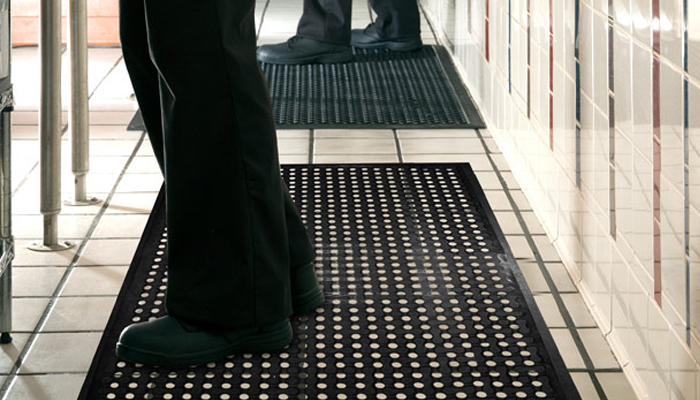 If you opt for this awesome invention, you may want to include an anti-fatigue mat. It’ll help prevent back pain and sore knees. Plus it’ll help you make yourself comfortable while standing! Happiness expert, Dr Bruce Wells advises going for flexible working hours, part-time options and home-based jobs. Frankly, it’s shifting to 9-to-5 work hours that opened the chapter of frantically chasing the time and our own tails along with it. And it’s awfully reminiscent of the awfully repetitive plot of Groundhog day movie. It’s the lack of time that gets us under a lot of strain. And a great chunk of that time gets frittered away on commuting. So, work out a way with your boss to get a remote day once in a while. And if your existing schedule is hectic, think about taking on a remote job. Working from the comfort of your home will help you pinch some time. Andi Lew, a certified food, lifestyle and wellness coach proposes using your lunch break time to maximise your wellness chances in your busy days. People are often willing to make lifestyle changes but the problem is they lack time to do it. So, an active and a relaxing lunch break is just what a busy and stressed out employee needs. And a nearby park is the perfect place to stretch your legs or even have lunch. 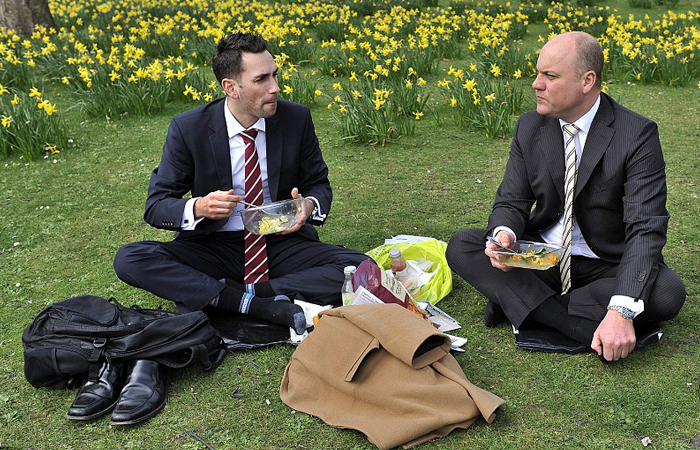 Having your lunch break in nature can be an easy way to reduce your work-related stress. Food Standard for Australia and New Zealand Working Group found the anxiety triggering levels when it comes to caffeine. It’s 210 mg, for adults. So play it smart with caffeine-loaded drinks. When duty calls we all want to be at our best. And the reality is that we often need to stay ahead of the game in order to thrive in the competitive world. This is usually paired with a few coffee mugs over the top in order to reach our peak levels of alertness. But here is where experts raise a red flag. 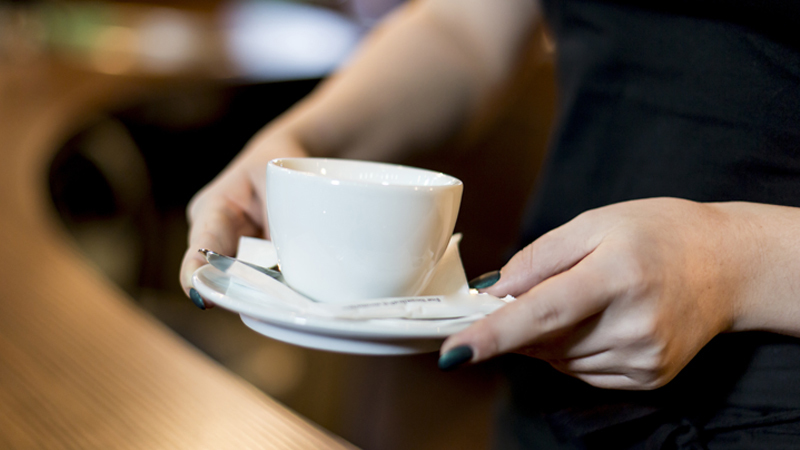 “When you’re at work, try swapping your large cup with 2 sugars for a green tea. Green tea still contains caffeine (in a smaller dosage), but it also has a substance called L-theanine. This works alongside the caffeine to enhance your alertness, but it also helps to reduce the crash and anxiety that is sometimes associated with caffeine intake. 7. Gratitude, Where Art Thou? Muneesh Wadhwa from Humanity in Business encourages people to try and focus on things they can be grateful for every day. Compiling the list and coming back to it again the next Monday helps people feel better about their jobs. We all know it can get pretty hard trying to place ourselves and thrive in the demanding modern world. Juggling our daily duties and swimming against the strong modern-day currents can be darn tiring. But The Langley Group discovered a research showing that finding ways to be grateful can give a big boost to our happiness and wellbeing. Addressing someone with a word of thanks makes them feel good and makes us feel even better. If reciprocated, it has a ripple effect, spreading happiness and positivity among people. Let’s face it – taking care of our health oftentimes requires a bunch of energy and effort. Yet, most of our tips here are easy to use and fit into your busy schedules, while still working wonders for your health and well being. 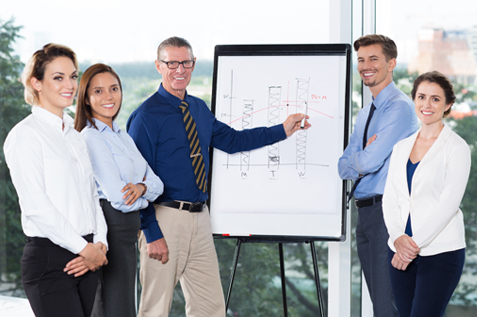 Therefore, make sure you don’t miss out on this fantastic list of employee wellness ideas for more invaluable tips from wellness and health experts. Putting those tips into practice is a no-brainer. They’ll help you take major steps towards your well being, while you could bet that what you’re actually doing is having some fun.